'Dacapo Records' a note in this box set informs us 'was founded in 1986 with the purpose of releasing the best of Danish music past and present.' With that in mind, it is hardly surprising that the company has the majority of Nielsen's music in its catalogue. He's a quirky composer, but he's also a national icon, and his work is excellently served here by Danish performers who really get inside the music. You might not guess from the elegant packaging, but this 'Masterworks' series is a reissue project, made up of recordings that span almost the entire history of the Dacapo label. Each of the six discs in this box has been previously released, and although much thought has gone into the design, the individual discs retain a certain autonomy. That's partly because of the ordering of works, which is roughly chronological on each disc, so switching from one disc to another usually involves a leap back from the 1920s to the 1880s. The programme notes from the original releases are combined in the liner, making for an impressive 20 pages of information. Even more impressively, the two discs that were originally released on SACD (the string quartets) remain on SACD. The chronology on each of the discs allows the listener to trace a narrative from Nielsen's folky nationalism of the 1880s to his more brusque anti-Romantic style of the 1920s. However, his output in the various genres represented here varied wildly from period to period. So the string quartets on the first two discs are almost all from the 1880s, while the wind music on the third disc is mostly from the 1920s. Listeners who are after that typical Nielsen sound, that constructivist/Shostakovich thing that makes his symphonies so distinctive, should focus on the later music, discs three and four in particular. The string quartets aren't nearly as remarkable or interesting. Even so, they are given excellent performances here, with strident and lively playing from the Danish String Quartet. Stylistically, these quartets require a fine balance between the Classicism of Schubert and Beethoven, to which Nielsen regularly refers, and the grounded folky gestures he adds to ensure his Danish identity is not forgotten. That last quality comes through in a (no doubt deliberate) unevenness in the sound, with lines from the middle of the texture often rising to the surface as a phrase plays out. Some of this string quartet playing is also surprisingly aggressive, in the Scherzo of the Op.13 quartet for example, but never to the point of excess. The SACD audio for the string quartets is good, but the studio sound is a little constrictive, and ironically the normal CD audio on the third and fourth discs is superior. The third opens with an early Piano Trio in G major, which is even more Schubertian than the early string quartets, but it then moves on to some classic Nielsen. Serenata in Vano from 1914 takes us straight into the composer's mature style, with all its grace and wit. This is followed by his Wind Quintet Op.43 of 1922, to my ear the most accomplished and distinctive work in the whole set. The violin works on the fourth disc are also impressive, especially the sonatas. The First perfectly encapsulates the Nielsen sound of the 1890s, mixing as it does lively rhythms and a bright sound with a feeling of groundedness that comes from the music's now distant folk roots. The Second Sonata is from 1912 and is a considerably more complex and sophisticated work. But violinist Jon Gjesme draws on a palette of colours and sounds that is ideal for both works, and his performances are matched in quality by those of Tue Lautrup, who concludes the disc with two extended works for solo violin. The first four discs were all recorded in 2006/7, but when we reach the fifth we jump back to 1981. The pianist Herman D. Koppel apparently played Nielsen's piano works to the composer himself when he was young. By 1981 he was in his 70s, but his playing still has remarkable dexterity. Nielsen includes a bit of everything in his piano music, and there is plenty of humour here, but plenty of drama too. Koppel shies away from big, charismatic readings, but his performances are still convincing. The dynamic range isn't huge, but it is difficult to tell if this the result of reserve on the part of the pianist or limitations in the sound technology. Despite its vintage, the recording is digital. A little more bloom on the piano sound, and perhaps a little more bass resonance, would be welcome, but otherwise the sound quality is eminently serviceable. Listening to these discs back-to-back, the over-riding impression they give is of a composer who was as eclectic as he was accomplished. The liner notes lament that his work for string quartet falls away before his more distinctive mature period. But as the third disc demonstrates, woodwind instruments were a far better vehicle for this later style anyway. 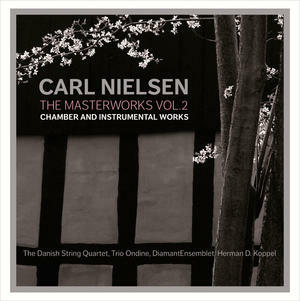 The quantity of material here, and the quality in which it is performed and presented, allows interested listeners to make there own minds up about the relative merits of Nielsen's various chamber works. Personally, I like the new stuff better than the old stuff.